Formerly known as the North American LCS, the spring split for the 2019 League Championship Series – or LCS for short kicked off on January 26. Through their respective achievements, all eyes were locked onto the opening game between Cloud9 and Team Liquid and rightfully so. This opening bout paved the way for what was to be an exciting and action-packed first week. Despite not taking home the gold Cloud9 won over the hearts of League of Legends fans across the globe with their semi-final appearance at the 2018 League of Legends World Championship. With their innovative strategies and relentless fighting mentality Cloud9 shocked the world by progressing out of the group of death and would go on to reach the semi-finals – the first North American team to do so since Season 1. The grass looks greener on the other side for the boys in blue, they started the 2018 Summer split without a clear direction when sitting at 1-5 and in dead last. However, through excellent player management and hard work Cloud9 are a force to be reckoned with heading into the spring split. The start of franchising gave Team liquid a new lease on life, a team once struggling to remain in the North American LCS was able to build a roster capable of securing the organisation their first championship – winning both the spring and summer split in 2018. Team Liquid spared no time in making changes to their winning formula, picking up star players Nicolaj “Jensen” Jensen and Jo “CoreJJ” Yong-in. 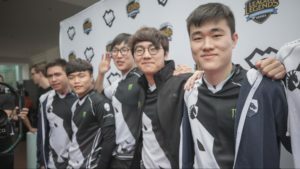 Team Liquid is once again the favourites heading into the Spring Split, having made major upgrades in the weak areas of their team – allowing Pobelter and Olleh to move to Flyquest and Golden Guardians respectively. On paper, the roster is much stronger than any other in the league and is surely one other teams will worry about. The amount of hype regarding both Cloud9 and Team Liquid will not go quietly into the night. North America has a reason to be excited about the future, C9 has built the foundation for TL to follow with their top four placement at Worlds. Despite the heartbreaking group stage elimination, Team Liquid are determined to make the region proud by building a roster that is destined for greatness, both on a domestic and international level. The main concern around this opening match was how good the two sides actually were. Cloud9 lost their star player to Team Liquid – bringing in Yasin “Nisqy” Dinçer (another highly rated European mid-laner) from Splyce. Both teams are expected to light the league on fire, with Cloud9 bootcamping in Korea since their semi-finals elimination and Team Liquid with their superstar acquisitions. The opening match of the LCS spring split delivered the hype, Team Liquid and Cloud9 put on a performance worthy of being in the finals. The North American titans came firing out of the gates, living up to the hype as the two most “aggressive” teams in the region. Whilst there were sloppy team fights displayed by both teams – the blueprint for the 2019 Spring Split was there, and it looks like Cloud9 and Team Liquid are going to dominate. Whilst they didn’t get the win, Cloud9 displayed an impressive performance against the odds-on favourite to win the split. Nisqy had a great showing in his first week in C9 colours and was one of the best players on the team along with Eric “Licorice” Ritchie, who is again proving to be the best Top Laner in the LCS. Team Liquid has silenced their early season critics; the big question regarding this roster was how Jensen and Doublelift could co-exist. Jensen pulled in two solid performances whilst Doublelift continued where he left off – being the best AD Carry in North America. In the early battle Team Liquid has the lead, but they haven’t yet won the war.